If you’re staying in Nassau during your time in The Bahamas, you will still have the opportunity to see the famous Swimming Pigs. 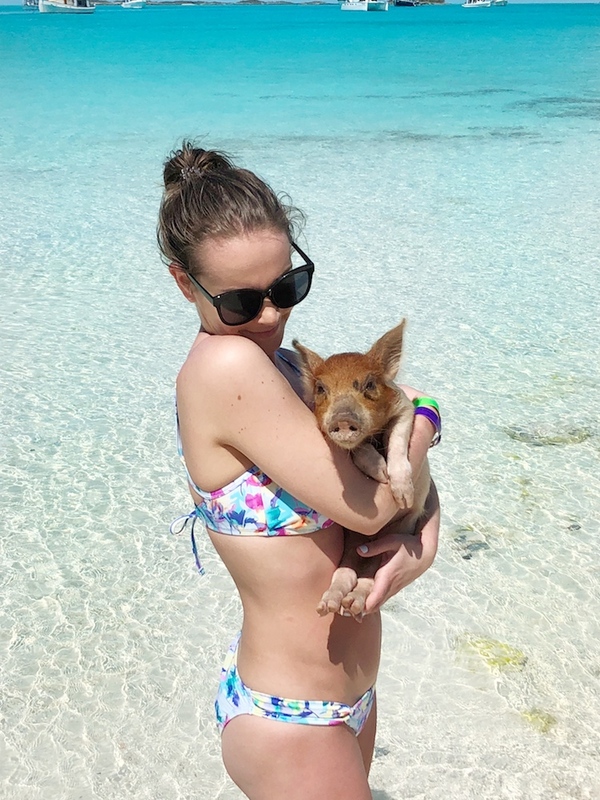 While the Swimming Pigs live in The Exumas you can book a day trip to see them and other famous sites such as the Nursing Sharks, Iguana Island and other beautiful islands. There are many different tour companies that will take you on a day trip to Pig Beach from Nassau but make sure you do your research. Each tour provider seems to have a different type of boat that takes you there and you’ll want to pick one that you know will be comfortable sitting on all day. Some just looked like the had saddle seats which I feel like would be uncomfortable by the end. I know this might not seem important but the majority of the day you’re on the boat so you’ll want to be comfortable. I booked with Hidden Beaches who has seats all at the back of the boat, two at the front and then bean bag chairs at the nose of the boat. The beanbag chairs might not look comfy, but they were awesome! They pick you up from the harbour that is located right in front of Margarita Ville on Paradise Island (where The Atlantis is). It’s a quick walk from really any hotel on Paradise Island or a short cab ride for other hotels. During the trip, they had free beer for everyone which was a nice surprise. If you’re reading this you probably have already done some research on the price of this tour and know that it is around $400. With that price tag, providing everyone with beer and snacks throughout the day was a nice perk! The day starts with about a 1.5-2hr boat ride to Iguana Island where you spend 15-20 minutes feeding them. For all stops, your tour provider will have food for you to feed the animals. After Iguana Island, it’s about another 45min boat ride to Pig Beach. This is the longest stop with about 40 minutes to play with the pigs. From Pig Beach it’s a short boat ride to Staniel Cay Yacht Club where you will have lunch. There are also Nursing Sharks here that you can swim with. Next, you’re off the Compass Cay for 15-20mins where there are more Nursing Sharks. If you’re wanting a photo with the sharks, wait till you get to Compass Cay. I found the water was much prettier compared to the Staniel Cay Yacht Club. Last stop of the day is a beautiful beach where you can relax or go for a swim for 30 mins. From there you boat back to Nassau and will be dropped off at the same place you started. Throughout the whole trip, the tour guides point out all the celebrities islands where are unbelievable. Hidden Beaches provided me with this tour during my stay. All opinions are my own. Next Post Do Cougar Rain Boots Really Keep Water Out?